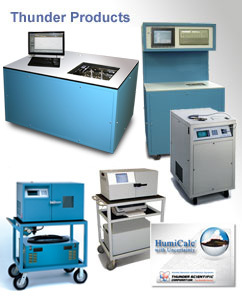 We are the world's premier manufacturer of humidity chambers and humidity calibration equipment, with a full line of humidity measurement and calibration instruments. Our six humidity generation models control humidity parameters over a wide range for precise calibration of today's sophisticated hygrometers. Automated, low humidity, Two-Pressure, and Two-Temperature models, are all traceable to the International System of Units (SI) through NIST-maintained standards. © Thunder Scientific Corporation. All Rights Reserved. ® THUNDER SCIENTIFIC is the registered trademark of Thunder Scientific Corporation.